This Sunday’s Gospel (28th Sunday in Ordinary Time, Year A) tells of a great banquet God has in store for us — and warn us that if we take it for granted, we won’t be able to partake. We are all probably familiar, at least from movies, with the attitude the upper class has toward their servants. The servant exists to serve, and the master expects to be served. This is the same attitude people tend to have toward restaurant wait staff. If you are kind about it, there is nothing wrong with that. That is what the waiter is being paid to do. But in this Sunday’s Gospel, a “customer” in heaven learns the hard way not to treat his host like the waiter. In the long version of the Gospel, Jesus tells the story about a commoner who is not dressed properly for a royal wedding feast. If that sounds harsh, then we need to understand the nature of the wedding garment. In the Ignatius Study Bible, Scott Hahn and Curtis Martin explain that the feast is the sacraments, and the “wedding garment” is prayer, alms and fasting. First, the feast was in no way deserved by the attendees. The king had invited his royal guests and they had refused to come. Then he shared his menu with the invited and got less interest. Last he invited all to the feast. The guest lists are symbols of the Jews and Gentiles, or of the religious and the irreligious, but the result is the same: These at the banquet should in no way have felt entitled to the feast. Second, the wedding feast was extravagant. 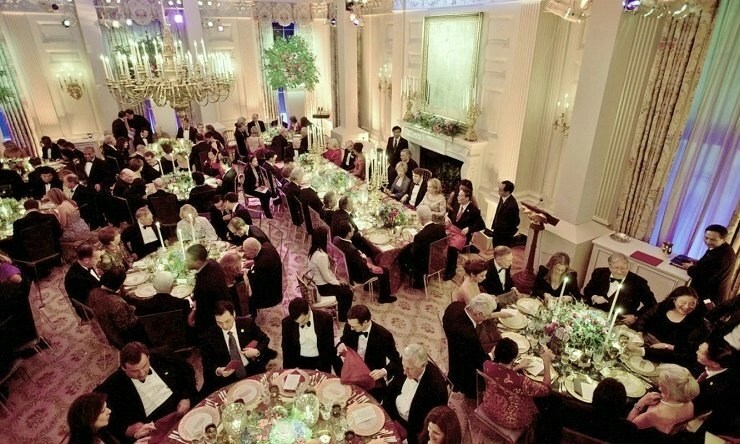 This is a type of the heavenly banquet, which is described in our first reading as “a feast of rich food and choice wines, juicy, rich food and pure, choice wines.” Don’t imagine a cafeteria line; imagine a White House state dinner. The king gives the errant guest a chance. When asked why he wasn’t dressed in a wedding garment, the man might have replied, “I am so sorry. I didn’t know. Let me fix it!” But the man said nothing. But the guest got confused, it seems, about who was the King and who was the subject. If we have the same attitude toward the Father in heaven that the prime minister of Belgium has toward the White House wait staff, we are doing God a great disservice. The Eucharist is a rich and abundant feast, to which the proper response is “I am not worthy.” If we expect to receive the Eucharist without having confessed our serious sins, the King will reject us as certainly as he rejected the guest with no wedding garment. We need to learn to behave in the way appropriate to the king’s table. If not, we will be out of place there. And that is one table where we want to feel right at home.